Scottish Verse to Landscape DVD. Take in the dramatic and contrasting beauty of Scotland. Experience both the traditional and popular poetry and verse whilst immersing yourself in the passion and emotion of Scottish Verse To Landscape. Scottish Verse To Landscape . The Quick and Easy Spotter's Guide. 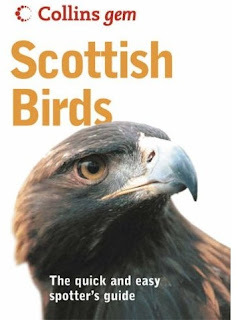 This is a beautifully illustrated and well organised pocket book, identifying some one hundred and eighty or more birds found in Scotland. Organised around the habitats frequented by the birds, and therefore offering the best probability of spotting them, the full colour illustrations are graced with pen portraits of each bird, even their Gaelic names are offered. Places to visit are recommended, presenting you with a stimulus to get out and look rather than wait for something to fly your way. Scotland Birdwatching. 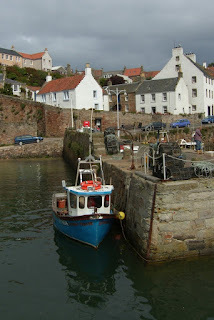 A few photos of Cellardyke, my hometown fishing village in the East Neuk of Fife, Scotland. Harvest Time, today in Scotland. Harvesting winter wheat, on a Scottish farm. The wheat had been planted last August or September. Newhaven Cream. This baked fish pudding gets its name from an old fishing village near Edinburgh. It may also be steamed in a bowl for about one and half hours, instead of baking in the oven. One pound (450 g) of Aberdeen fish fillet. A half pint (300 ml) of milk. Two ounces (50 g) of melted butter. Three ounces (75 g) of fresh white breadcrumbs. Two tablespoons of chopped parsley. One quarter pint (150 ml) of cream. One quarter pint (150 ml) of milk. A half an ounce (15 g) of butter. A half ounce (15 g) of flour. One tablespoon of chopped parsley. Put the fish into a saucepan. Pour over the milk. Bring to the boil, cover and simmer for five minutes. Skin and flake the fish. Reserve the cooking liquid. Put the melted butter, breadcrumbs, parsley, eggs and cream into a bowl and add the fish. Mix together thoroughly. Season with salt and pepper. Pour into a greased two pint (1 litre) souffle mould. Cover with greaseproof paper or foil. Set the dish in a tin containing about one inch (2.5 cm) water and bake in a moderate oven for thirty minutes. Melt the butter in a small saucepan and add the flour. Cook gently for a couple of minutes, then gradually add the milk, stirring all the time to prevent lumps. Serves 4. Best Scottish Cooking. Explore Your Scottish Highland Heritage on an Ancestry Tour of Scotland. Best Scottish Tours, Best Scottish Food, Best Scottish Hotels, Small Group Tours of Scotland. The impression Edinburgh has made on me is very great; it is quite beautiful, totally unlike anything else I have ever seen; and what is even more, Albert, who has seen so much, says it is unlike anything he ever saw. A wishbone for your heart's desire. Small silver charms were stirred into this dessert. Each charm had a special meaning. The dessert was eaten on the night of Halloween and each guest would hope to find a favourable charm in his or her portion. Two ounces (50 g) of lightly toasted medium oatmeal. A half a pint (300 ml) of double cream. One ounce (25 g) of caster sugar. One tablespoon of dark rum. Whip the cream until it holds its shape. Stir in the sugar and rum and whisk again until thick. Gently stir in the toasted oatmeal. Chill well. Serves 4. 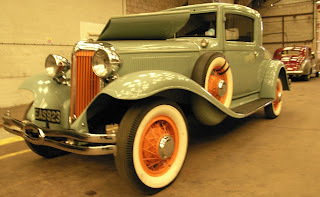 Tour Scotland Highland Gatherings. Attended Srathardle Highland Gathering today. This was the 126th annual Strathardle Highland Gathering and Show. A traditional, friendly games located in beautiful Kirkmichael, Highland Perthshire, near Pitlochry, Blairgowrie and Glenshee. 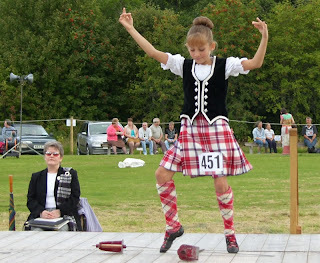 Events included: Scottish Dancing Competition, Highland Games including Caber, Hammer, Weights, and Shot Put. 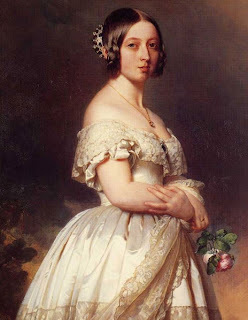 There was also a Grand Procession, Home Industries, including, flower arrangements, vegetables, jams, cakes, pies, photographs, and Piping Competition, Tug of War, and Children's Races. Highland Gathering Photographs. Tour Scotland Sword Dance. 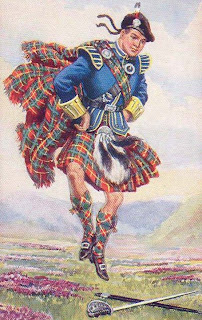 Malcolm Canmore, King of Scots, is credited with this dance. It is said that in 1058 he slew his opponent and placed his and his enemy’s sword on the ground in the form of a cross and danced in triumph. Scottish Scones probably originated from the Dutch Schoonhrot, a kind of square cake made in the sixteenth century. They were traditionally cooked on an iron girdle which was rubbed with salt and not greased. To make the best scones, handle as little as possible and make as quickly as possible. 8 ounces (225 g) of flour. One teaspoon bicarbonate of soda. One half teaspoon cream of tartar. One half ounce (15 g) of caster sugar. One quarter pint (150 ml) of buttermilk. Pre-heat the girdle or a lightly greased frying pan. Sift the flour, bicarbonate of soda, cream of tartar and salt into a bowl. Add enough buttermilk to make a fairly stiff dough. Knead lightly on a floured board until smooth. Roll out the dough to make a circle about half an inch thick. Cut the circle into quarters. Cook the quarters on a hot girdle for about ten minutes on each side or until risen and beginning to brown. Wrap in a clean cloth and cool on a rack. Though the rooms be poor indeed. Tour Scotland in August. Dear Sandy, I just wanted to write and say thank you for the wonderful time we had during our tour of Scotland. You showed us beautiful and stunning places that we would never have seen without you. Your knowledge of Scotland and its people was wonderfully informative. Your humor and wit made us feel at ease. You have provided me with memories I will cherish the rest of my life. The Dupplin Cross; Neil with his dogs; Alan and his horses. These were experiences that will never be matched. I so appreciate your care and kindness to my family, especially my parents. We all had a great time. Thank You again, Tamie Lewis. 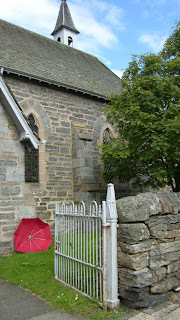 Tour Scotland in August Photographs. 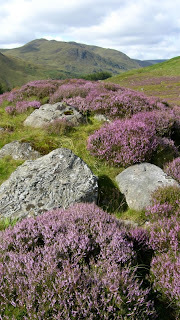 When does Scottish Heather bloom ? When does Scottish Heather bloom ? The answer is that it is blooming right now. After overnight rain in Scotland it is always worth viewing local Scottish waterfalls during the next day. The Literary Traveller in Scotland opens up Scotland's literary landscape for the first time in one concise volume. All prominent Scottish writers from the fourteenth to the twenty-first century are included and discussed in their literary, historical and cultural contexts, set in the landscapes where they were born and which inspired them. It details the birthplaces, childhoods, former homes and burial places of famous Scottish authors, uncovers sites, restaurants and pubs with a literary connection, and lists notable bookshops, literary museums and other places of relevance in the world of Scottish writing. 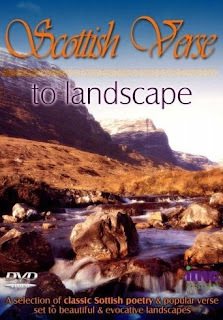 This attractive tome will be lavishly illustrated with photographs, while maps will enhance many of the entries, including the Kidnapped trail, Boswell and Johnson's Highland journey, Burns country, Richard Hannay's 39 Steps trail, the Pentland walks of Robert Louis Stevenson, a plan of Rosslyn Chapel, Gavin Maxwell's Sandaig, Compton Mackenzie's Barra, the Ettrick Valley of James Hogg, the Mearns of Lewis Grassic Gibbon, J. M. Barrie's Thrums and the ports and pubs of Para Handy, to name a few. There has never been a national literary guide for Scotland until now, and The Literary Traveller in Scotland will be a welcome first for book lovers all over the country and beyond. The Literary Traveller in Scotland: A Book Lover's Guide . Tour Scotland, on an Ancestry Tour of Scotland. Best Scottish Tours, Best Scottish Food, Best Scottish Hotels, Small Group Tours of Scotland. Toured Kinloch Rannoch, Scotland. Much better weather today in Highland Perthshire. Still too soon to completely discard the umbrella. 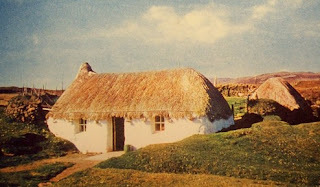 One hundred and fifty years ago, a fisherman's house on the East Coast of Scotland may have been little better than a low, narrow, smoke-grimed "but and ben," but it was definitely home. The walls were rough and often unplastered. The floor of the kitch was bare earth. Beneath the open fireplace stood the "creepie," a low stool which served as a chair. Under the little deep-set window, filled with coarse greenish glass, through which the sun dimly found its way as through a thick curtain, stood a strongly made kist or sea-chest, holding clothes. The big double-bed was hidden in a recess, closed in either by doors or curtains. The furniture of the living room was completed by a table, press and a corner shelf, with its array of dishes and ornaments brought home by seafaring sons. In the yard outside were tarred sheds for storing nets and gear. 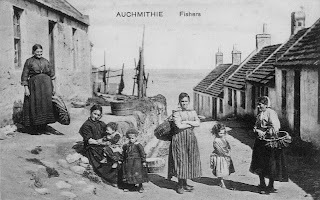 Tour the Fishing Villages of Scotland, on an Ancestry Tour of Scotland. Best Scottish Tours, Best Scottish Food, Best Scottish Hotels, Small Group Tours of Scotland. Tour Lerwick, Shetland, Scotland on an Ancestry Tour of Scotland. 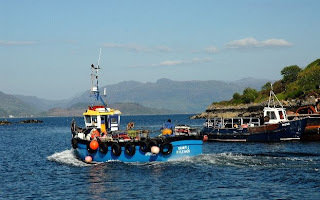 Best Scottish Tours, Best Scottish Food, Best Scottish Hotels, Small Group Tours of Scotland. Tour the Isle of Skye, Scotland. 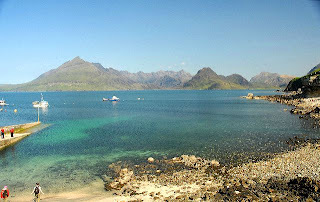 Tour Skye, Scotland, on an Ancestry Tour of Scotland. Best Scottish Tours, Best Scottish Food, Best Scottish Hotels, Small Group Tours of Scotland. Photographs of Scotland by, Dave and Kathy Dove. Auchtermuchty Festival, Fife, Scotland, includes a traditional music festival featuring concerts, ceilidhs, competitions, workshops and wonderful sessions in the village pubs. Auchtermuchty Festival, Fife, Scotland. Dancing in the square at Muchty Festival. Edinburgh Castle, Scotland. 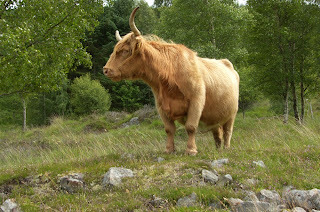 Photographs of Scotland by, Dave and Kathy Dove, Cincinnati area freelance photographers. Photography for Real Estate Virtual Tours, commercial products, sports, editorial, freelance, and stock photos in Greater Cincinnati. Fairground rides, side stalls and other attractions in an area of Church Street, at the Lammas Fair in St Andrews, Fife, Scotland. 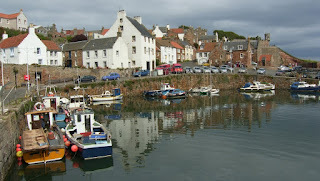 A sunny afternoon at Crail harbour, East Neuk of Fife, Scotland. 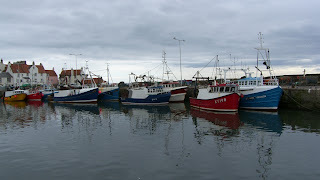 Fishing boats in Pittenweem Harbour, East Neuk of Fife, Scotland. 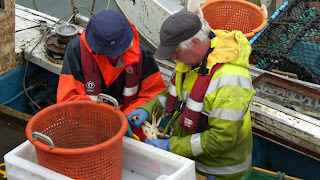 Pittenweem Fishermen bringing in a good catch of crabs at Pittenweem Harbour. Auld Lang Syne being sung at the Edinburgh Military Tattoo, Edinburgh Castle, Edinburgh, Scotland. The colourful kaleidoscope of music, dance and pageantry at the Edinburgh Military Tattoo, Edinburgh Castle, Scotland. Scotland Touring Guide. A comprehensive guide listing over seventeen hundred of the best Scottish places to visit and things to do. Easy to use: tourist attractions listed by area and category; locator maps and index. Features all categories of Scottish tourist attraction, from Scottish castles, country parks and Scottish cathedrals, to Scottish gardens, boat trips, museums and distilleries, scenery and wildlife. 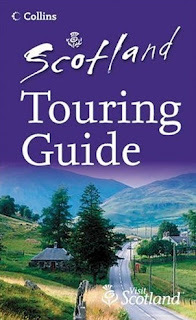 Essential information on each attraction includes: how to get there by road and public transport, opening hours, telephone numbers, websites, facilities, admission charges and disabled access, and a description of what the attraction has to offer Practical Scottish touring information and useful contacts are listed in the introduction. 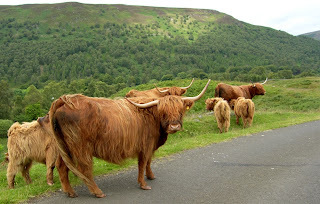 Scotland Touring Guide (Visit Scotland) . Aberarder,Aberchalder, Achagate,Achanalt,Achany, Achaphubuil, Acharacle, Acharn, Acharra, Acheninver, Achentoul, Achfary, Achgarve, Achinduich, Achintee, Achintraid, Achlain, Achlyness, Achmelvich, Achmore, Achnahanat, Achnasheen, Achness, Achriesgill, Achterneed, Ackergill, Advie, Aird of Sleat, Airor, Aitnoch, Allanfearn, Alltbeath, Alltnacaillich, Alltsigh, Alness, Altanduin, Altnaharra, Alvie, Ankerville, Ankerville Corner, Applecross, Ardcharnich, Ardclach, Ardersier, Ardgour, Ardheslaig, Ardmair, Ardnarff, Ardnastang, Ardshealach, Ardslignish, Ardtoe, Ardullie, Ardvar, Ardvasar, Ardverikie, Arisaig, Armadale, Arnisdale, Arnish, Astle, Athnamulloch, Auckingill, Auldearn, Aultgrishan, Aultivullin, Aultnaharrie, Aviemore, Avoch, Backies, Badbea, Badcall, Badcaul, Badenoch, Badenscallie, Badluarach, Badrallach, Balaldie, Balavil, Balblair, Balblair, Balchladich, Balintore, Ballachulish, Balmacara, Balmore, Balnacarn, Balnakeil, Banavie, Barbaraville, Barevan, Barr, Barrisdale, Bearnock, Beauly, Belladrum, Belloch, Belmaduthy, Bernera, Bernisdale, Berriedale, Bettyhill, Bilbster, Blaich, Blain, Boat of Garten, Boath, Bohenie, Bohuntine, Boleskine, Bonar Bridge, Boreraig, Borgue, Borve, Bowermadden, Bowertower, Bracadale, Brackley, Bracora, Braemore, Braemore, Brawl, Breakish, Bridgend, Brin, Broadford, Brochel, Brora, Bunavullin, Bundalloch, Calligarry, Calrossie, Camasterach, Camastianavaig, Camasunary, Camban, Canisbay, Cannich, Caradal, Carbost, Carnach, Carnach, Carnoch, Carrbridge, Cashel Dhu, Castletown, Catlodge, Cawdor, Cilmalieu, Clachtoll, Clashmore, Clashnessie, Clava Cairns, Cleadale, Clovullin, Clunas, Clune, Clunes, Clyne, Coignashie, Coillemore, Coillore, Colbost, Conon Bridge, Contin, Corpach, Corran, Corran, Corrimony, Corrlarach, Corrybrough, Corrykinloch, Cougie, Coul, Coulags, Cove, Craggie, Craig, Craig, Craskie, Croachy, Croick, Cromarty, Cromdale, Crossburn, Croy, Cuaig, Cuil, Culbokie, Culkein, Culmaily, Culrain, Dalbeg, Dalchreichart, Dalcross, Dalelia, Dalmigavie, Dalnahaitnach, Dalness, Dalroy, Dalwhinnie, Derraid, Diabaig, Dingwall, Dores, Dornie, Culloden Battlefield, Dorrery, Dounreay, Drumbeg, Drumfearn, Drumgask, Drumnadrochit, Drynoch, Duirinish, Duisky, Dulsie, Dunan, Dunbeath, Dundreggan, Dunnet, Dunvegan, Durness, Duthil, Eabost, East Canisbay, East Croachy, East Laroch, Easter Clynekirkton, Easter Fearn, Easter Rarichie, Easter Urray, Edderton, Edinbain, Eil, Elgol, Ephin, Embo, Erbusaig, Eriboll, Errogie, Eskadale, Etteridge, Evanton, Evelix, Eyre, Faillie, Fain, Farr, Farr, Faskadale, Fasnakyle, Fassfern, Fearnmore, Ferness, Fernilea, Feshiebridge, Fiskavaig, Fiunary, Flashader, Flodigarry, Fodderty, Foinaven, Forse, Forsinain, Forsinard, Fort Augustus, Fort George, Fort William, Fortrose, Foyers, Freswick, Gairloch, Gairlochy, Galtrigill, Garbat, Garrafad, Garvan, Garve, Gills, Glen Spean, Glenborrodale, Glenceitlein, Glencripesdale, Glenelg, Glenelg Ferry, Glenfinnan, Glenmore, Glenmore, Glenrossal, Glenurguhart, Gobernuisgeach, Golspie, Gordonbush, Gorstan, Gorteneorn, Gortenfern, Grantown-on-Spey, Greenfield, Greenland, Grumbeg, Halistra, Halkirk, Hallin, Heilam, Helmsdale, Hill of Fearn, Hilton of Cadboll, Husabost, Idrigil, Inchlaggan, Inchnadamph, Insh, Inshes, Inver, Inver Mallie, Inverailort, Inveralligin, Inveran, Inverbroom, Invercannich, Invercassley, Invercoe, Inverdruie, Inverfarigaig, Invergarry, Invergordon, Inverguseran, Inverie, Inverinate, Inverkirkaig, Inverlael, Inverlaidnan, Inverlair, Invermoriston, Invernaver, Inverness, Inversanda, Invershiel, Invershin, Isle of Skye, Isleornsay, Jamestown, Janetstown, Jemimaville, John O' Groats, Kearvaig, Keiss, Kenmore, Kentallen, Kentra, Keoldale, Kerrysdale, Kessock, Kilbride, Kilchoan, Kildonan, Kilfinnan, Killilan, Kilmaluag, Kilmarie, Kilmorack, Kilmore, Kilmory, Kilmory, Kilmote, Kilmuir, Kilournan, Kilvaxter, Kinbrace, Kincardine, Kincraig, Kingsburgh, Kingussie, Kinloch, Kinloch Hourn, Kinlochbervie, Kinlocheil, Kinlochewe, Kinlochleven, Kinlochmoidart, Kinlochmore, Kinrara, Kintail, Kintradwell, Kirkhill, Kirkton, Kirtomy, Klibreck, Knockan, Knockbain, Knockfin, Kyle of Lochalsh, Kyleakin, Kylerhea, Kylestrome, Laggan, Laide, Lairg, Langwell, Latheron, Leckmelm, Ledbeg, Ledmore, Letterewe, Letterfearn, Letterfinlay, Lewiston, Liddesdale, Little Creich, Little Gruinard, Littleferry, Loch Ness, Loch Ness Cruise, Loch Ness Monster, Lochailort, Lochaline, Lochcarron, Lochend, Lochinver, Lochtreighead, Lonbain, Lone, Lorgill, Lothbeg, Lower Derraid, Lower Diabaig, Lower Dounreay, Lower Gledfield, Lubcroy, Lusa, Lusta, Lybster, Mains of Dalvey, Mallaig, Melgarve, Melness, Melvich, Mey, Mid Clyth, Midtown Brae, Milovaig, Milton, Monessie, Monkstadt, Morvich, Moy, Mugeary, Muir of Ord, Munlochy, Mybster, Naast, Nairn, Navidale, Nedd, Nethy Bridge, New Kelso, Newtonmore, Nigg, North Ballachulish, North Erradale, North Kessock, Occumster, Ochtow, Ockle, Oldshore, Oldshore Beg, Oldshoremore, Ollach, Onich, Orbost, Ord, Overscaig, Oykell Bridge, Peanmeanach, Plockton, Polbain, Polglass, Poolewe, Portgower, Portmahomack, Portnancon, Portree, Portskerra, Proncy, Pulrossie, Rahoy, Rarichie, Reay, Redcastle, Reiff, Reraig, Resipol, Resolis, Rhian, Rhiconich, Rhifail, Rhilochan, Ribigill, Rispond, Rockfield, Rogart, Rosehall, Rosemarkie, Roshven, Rosskeen, Rothiemurchus, Roybridge, Ruthven, Ruthven Barracks, Salen, Sallachan, Sallachy, Sandwood, Sangobeg, Sarclet, Scamadale, Scamodale, Scardroy, Scarfskerry, Sconser, Scoraig, Scotstown, Scourie, Scrabster, Shandwick, Sheigra, Shiel Bridge, Shieldaig, Shinness, Shirramore, Skail, Skeabost, Skelbo, Skiall, Skinidin, Skullomie, Skye of Curr, Slaggan, Slickly, Sourlies, South Erradale, South Kessock, Spean Bridge, Spinningdale, Staffin, Staxigoe, Stein, Stenscholl, Stittenham, Stoer, Stoul, Strathcarron, Strathpeffer, Strathy, Strollamus, Stromeferry, Strontian, Struan, Struy, Swiney, Syre, Tain, Talisker, Talmine, Tarbert, Tarbet, Tarskavaig, Teangue, Thrumster, Thurso, Tokavaig, Tole, Tomatin, Tomcrasky, Tomdoun, Tomich, Tongue, Torboll, Torcastle, Tordarroch, Tore, Torgulbin, Tormore, Torness, Torrin, Torroboll, Toscaig, Totaig, Trantlebeg, Trumpan, Tuirnaig, Uags, Uig, Uig Ferry, Ullapool, Unapool, Unish, Upper Camster, Upper Derraid, Upper Diabaig, Upper Dounreay, Upper Ethie, Urchany, Urray, Watten, West Canisbay, West Croachy, West Langwell, West Laroch, Wester Clynekirkton, Wester Fearn, Wester Rarichie, Wester Urray, Westerdale, Whaligoe, Wick, Woodside. 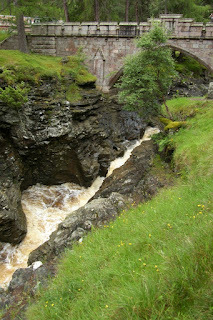 Tour Scotland, on an Ancestry Tour of Scotland. Best Scottish Tours, Best Scottish Food, Best Scottish Hotels, Small Group Tours of Scotland. Edinburgh Military Tattoo, Edinburgh Castle, Edinburgh, Scotland. The Mounted Band of the Blues and Royals. Pomp and ceremony from one of the finest cavalry bands in the British Army. Tour Scotland, on an Ancestry Tour of Scotland. Best Scottish Tours, Best Scottish Food, Best Scottish Hotels, Small Group Tours of Scotland. Alan Thomson of Tullochville Farm, near Aberfeldy, Perthshire, Scotland. Alan is an expert in Heavy Horses and Clydesdale Horses. A Highland Stream and Footbridge, South of Bridge of Balgie, Perthshire, Scotland. Traffic on the Killin Bridge, beside the Falls od Dochart, Stirlingshire, Scotland. Highland Cattle on the road at Meggernie Estate, Glenlyon, Scotland. Meggernie Castle. 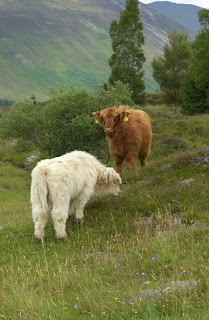 Highland Calves on Meggernie Estate, Perthshire, Scotland. 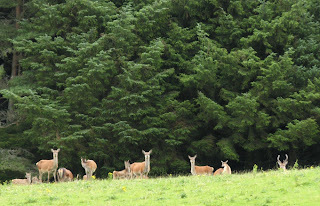 Deer in Glenlyon, Perthshire, Scotland. 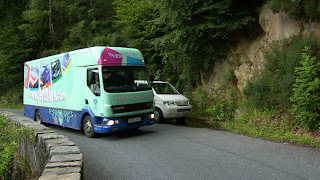 Perthshire Mobile Library in Glenlyon, Perthshire, Scotland. 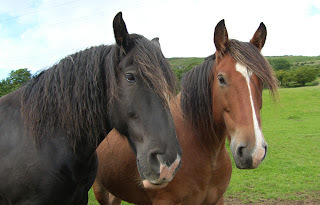 Clydesdale Horses North of Aberfeldy, Perthshire, Scotland. Scottish Guddling. To guddle for trout: First you need a shady hillside burn. A good sized one. One with a good flow of water. One with good sized boulders in it and with water about knee deep. Under the ledges of these boulders are where trout lay. You can scan the water for ages and not see a thing but they're there. They're shielded from over-flying predator birds that would scoop them up in a heartbeat. As they lay under the ledges of the boulders they're always facing upstream. As a morsel comes down with the current they dart out to get it and as quickly return to their hiding places. Read More. Linn of Dee, on the River Dee, is a rocky gorge six miles West of Braemar, Scotland. 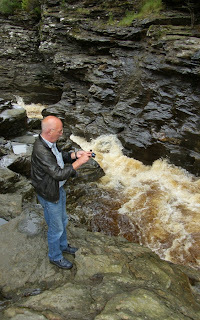 Peter Mannox at Linn of Dee, Scotland. At Linn of Dee, West of Braemer, Scotland, the River Dee passes through a long natural rock gorge. Glenshee, is a glen in eastern Perth and Kinross, Scotland, through which flows the Shee Water. Classic Restorations operate within a former linen works in the historic village of Alyth in Perthshire, Scotland. 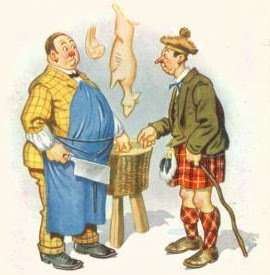 "I would like a Sheep's head please, and cut it off as close to the tail as you can." 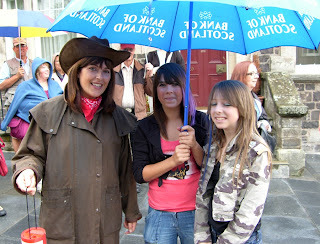 Local lasses at the Auchtermuchty Festival Parade. Auchtermuchty Festival Parade, Fife, Scotland. A wet Sunday afternoon for the community parade which started at the Square around 1pm, and was led by the Kinross Pipe Band. A Scottish shepherd in the Badenoch and Strathspey area of Scotland. Badenoch is a traditional district which today forms part of Badenoch and Strathspey, an area of Highland Council, in Scotland, bounded on the north by the Monadhliath Mountains, on the east by the Cairngorms and Braemar, on the south by Atholl and the Grampians, and on the west by Lochaber. 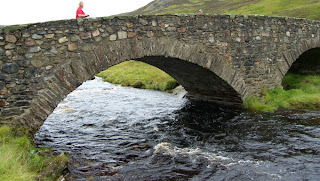 Tour Scotland, on an Ancestry Tour of Scotland. Best Scottish Tours, Best Scottish Food, Best Scottish Hotels, Small Group Tours of Scotland. 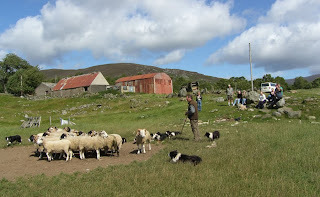 Working sheepdogs in the Badenoch region of Scotland, at Kincraig, just North of Kingussie. Scottish Pipe Bands marching through Newtonmore on their way to the Games Field at Newtonmore Highland Games, Scotland. Tour Scotland, on an Ancestry Tour of Scotland. Best Scottish Tours, Best Scottish Food, Best Scottish Hotels, Small Group Tours of Scotland. Scottish Highland Dancers doing the Highland Fling at the Newtonmore Highland Games, in Badenoch and Strathspey, Scotland. "Just my luck ! Nothing the matter with me, and good medicines going cheap. Tour The Highlands of Scotland. The official map of Scotland, published in association with the national tourist authority of Scotland. A comprehensive map showing the locations of over seventeen hundred of the best Scottish places to visit and things to do. Easy to use with comprehensive leisure and touring information. Features visitor attractions, including, Scottish Castles, Scottish churches, cathedrals and historic houses, art galleries, museums, distilleries, theatres and leisure centres, country parks, gardens, nature reserves, forest trails and wildlife parks, golf courses, fishing, boat trips and skiing, guided tours, monuments, antiquities, scenic and architectural features, camping and caravan sites, Tourist Information Centres and National Tourist Routes The map has comprehensive road and motorway information and a distance chart. Scale: 5 miles to 1 inch (1 : 300 000). Scotland Touring Map (Visit Scotland) . Best Scottish Hotels and Best Scottish Tours. Deeside and the Mearns, Scotland. The Highland Fault splits Deeside and the Mearns into two visually and economically distinct areas. 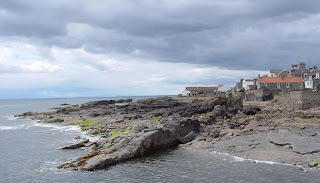 The mellow sandstone of the Mearns creates lush plough land and small clusters of old farming villages, with snug fishing hamlets squeezed between unforgiving cliffs. 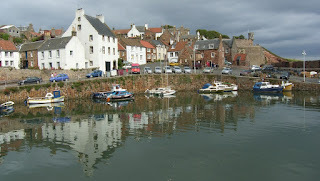 Stonehaven, with its ancient and accessible harbour, is the key town in the area. The stubborn granite of Deeside provides a dramatic landscape from the heights of the Cairngorms down to the awesome reaches of the river. Life was harder here, with small settlements growing up at the crossing points of the river, dependent on trade from the drove roads. 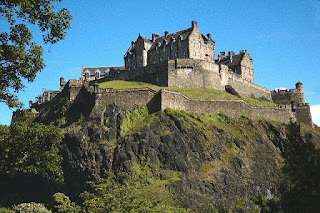 A few powerful lairds built some of the finest castles in Scotland up the river in the 17th century, and other houses appeared after the land was tamed by railway, and power tools could work the granite. Then Royal Deeside took on its gracious aspect as playground of the rich, with fishing lodges, fine villas along the railway and Balmoral providing a stunning summer home for the royal court. 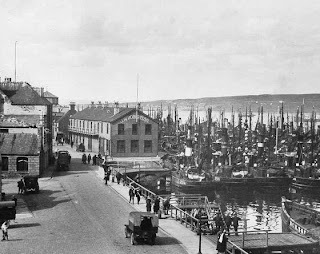 Today the area is proseprous hinterland to Aberdeen, with new oil wealth frequently coming in to restore the most vulnerable and interesting buildings. Although tourism is encouraged and housing pressures increase, the magnificent empty landscape with its moorland, waterfalls and ferocious sea cliffs dominate and keep man's efforts in perspective. 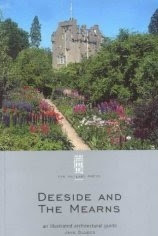 Deeside and the Mearns: An Illustrated Architectural Guide (RIAS Series of Illustrated Architectural Guides to Scotland) . The District of Moray. Foolish visitors have, throughout history, travelled through Moray. The wise ones stayed. They diverted from the main road from Aberdeen to Inverness; only a few yards were enough. They found a beautiful spot with a genial climate, semi-independent from the rest of Scotland, blessed with in fair quantities of exceptional scenery, recreation and history. For this is the country of Macbeth; once a centre of Pictland and brushed by the Romans, which became the great medieval Province of Moray. At Elgin was possibly Scotland's most beautiful cathedral, whose bishops resided in the majestic palace of Spynie. Temporal power lay in the great castles of Darnaway, Duffus, Balvenie, Gauldwell, Rothes, Drumin. Lochindorb and Auchindoun; the tower houses and classical mansions of later generations ans a rash of planned towns and villages from Cullen to Lossiemouth, Dufftown to Tomintoul. Here also are great churches, magnificent abbeys, substantial farms and a necklace of exquisite fishing villages. 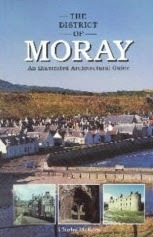 The District of Moray: An Illustrated Architectural Guide . Aberlour,Achnastank, Altyre, Alves, Archiestown, Ardwell, Auchbreck, Auchindachy, Aultmore, Bridge of Lossie, Buckie, Burghead, Cabrach, Carron, Coltfield, Craigellachie, Cullen, Cummingstown, Dallas, Delnabo, Drumin, Drybridge, Drybridge, Dufftown, Duffus, Dyke, Easter Elchies, Easter Gaulrig, Elgin, Keith, Findhorn, Findochty, Fochabers, Forres, Garmouth, Gaulrig, Hopeman, Ianstown, Inchrory, Keith, Kellas, Kingston, Kinloss, Kintessack, Kirktown of Deskford, Kirktown of Mortlach, Knock, Knockandhu, Knockando, Letterfourie, Lhanbryde, Longmorn, Lossiemouth, Lyne, Malt whisky capitol of the world, Milltown, Milltown of Auchindown, Moray Firth, Morayshire, Mulben, Newmill, Orbliston, Portessie, Portgordon, Portknockie, Pyke, Rafford, Rathven, River Spey, Rothes, Stotfield, Tomintoul, Tomnavoulin, Urquhart, Wester Gaulrig. Best Scottish Hotels and Best Scottish Tours. Lewis and Harris. The fierce Norsemen, intrepid missionaries and mighty Scottish clans - all have left a visible mark on the landscape of Lewis and Harris. This comprehensive guide explores sites of interest in the Western Isles, from pre-history through to the present day. 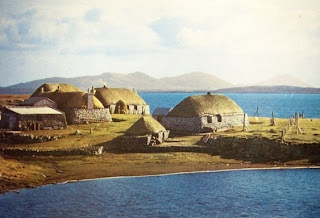 Harsh conditions failed to deter invaders from besieging these islands or intrepid travellers from settling, and their legacy has stood the test of time in an array of captivating archaeological remains from the stunningly preserved Carloway Broch, to a number of haunting standing stones, tombs and cairns. With captivating tales, including an intriguing murder mystery and a romantic encounter resulting in dramatic repercussions for warring clans, Francis Thompson introduces us to his homeland and gives us an insight into its forgotten ways of life. Leaving behind a wondrous legacy of haunting standing stones and carved relics, such as the famous Lewis Chessmen. Captivating tales, passed down through generations, include an intriguing murder mystery and a romantic encounter resulting in dramatic repercussions for warring clans. Current places of archaeological interest are explored, as are celebrated sites such as the stunningly preserved Carloway Broch and evocative black houses, giving insights into a forgotten way of life. 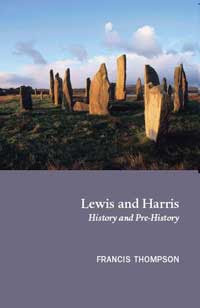 Lewis and Harris: History and Pre-history on the Western Edge of Europe .